The moment you arrive at Miso Susanowa and Misprint Thursday’s building, The Roof is Gone, your eyes and ears are put on alert. The main structure, constructed of wooden planks and encased in scaffolding (“I could actually build most of this in Nevada” says Miso), stands cross-like, assuming the air of a place of worship in the middle of a disaster zone. It generates a weather system of its own and is surrounded by swirling details; photographs spiral on the wind above, videos, embedded into prims, blink like lightning, and the static beginning of the soundtrack passes back and forth between your ears like sheets of heavy rain. And then you reach the eye of the storm, calm among the chaos. The song begins to soothe, there’s a living room to rest in, and, if you look carefully, you can even disappear quietly into the building. The piece is part political, part personal. It conjures up memories of Hurricane Katrina and other natural catastrophes. It also invokes psychological drama through childhood imagery – the house is breaking apart, little bicycles are tangled in spikes, photos of kids are bent and curled. Miso left her “digital DNA” for us to examine, in the form of a poster in hanging on a wall inside. Over 50 hours worth of work went into the build and it shows. 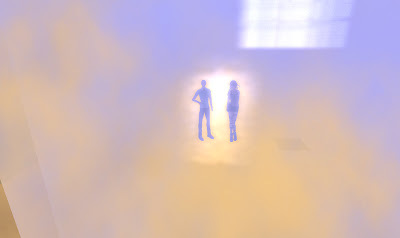 There are so many layers to explore (teleport yourself up several meters to experience the accompanying video to full effect) expect to spend at least half an hour to begin to scratch the surface. Miso explained that one of her main goals is to make art in SL that can be translated to the outside world. I look at this piece and see a maquette, a model that might be realized again in the actual world. The artists kindly offer a lovely freebie miniature of the piece, a great souvenir of BL 2009. Hey, can’t BL be extended for a week? There’s too much to see and do...! 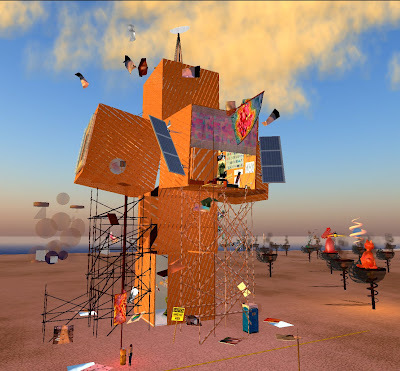 This just in from White Lebed, art director Burning Life: "The events and the activities will be closed in a few days, but the art and the builds will stay for another week and the gates will be opened till Nov 1st."